To celebrate the holiday season this year, I have my top six favorite places to go to enjoy the Christmas decorations at Walt Disney World. Many of them may look familiar as I'm sure they've appeared on the blog in the past - you can click here for more details about holiday decor all over Disney World. These picks are not in any order, because as I come to each of them it feels like that one is my favorite. So we're going to start with my favorite - the Polynesian Village! The swags are hung from oars overhead, which in turn are suspended from the ceiling on ropes of tropical flowers. SERIOUSLY GUYS. Icing on the Polynesian Christmas cake? The wreaths around the tiki torches in BouTiki. LOVE. ...HAVE YOU SEEN IT YET?? 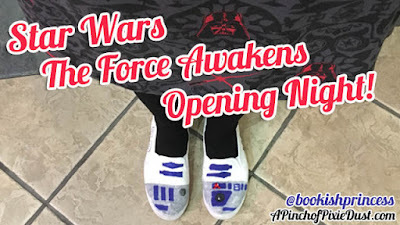 I was so nervous about Star Wars Episode VII: The Force Awakens, but I LOVED IT. We went opening night which was so much fun. Rey and Poe and BB-8...ahhhh fantastic! ...also how cute is this A Capella Star Wars Medley that the cast of The Force Awakens sang on Jimmy Fallon? currently reading...Pioneer Girl by Laura Ingalls Wilder. So cool to get another perspective on the Little House on the Prairie series! 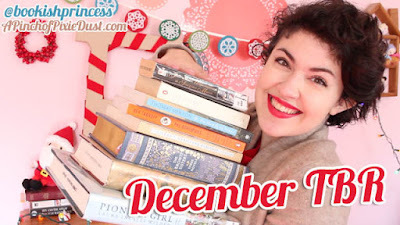 There are more books in my December TBR! currently Christmas shopping...on Rifle Paper Co.'s website because they have the prettiest stationery stuff. 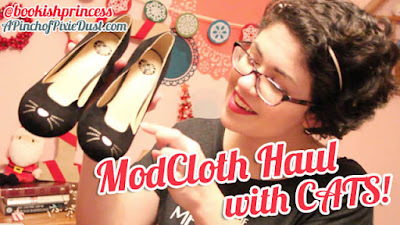 currently Holiday outfit planning...excited to wear some of the things I got from ModCloth earlier this month! Watch the cat-filled haul here. currently can't wait...for the Victorian-era Sherlock Special, The Abominable Bride this January. It looks AH-mazing! currently worried about...costumes at Disney World. Have you heard the news? Disney security found a gun in a man's bag at the park entrance last week, and Disney had been upping security measures, installing metal detectors, etc. Security is absolutely important, and it's great that Disney is increasing its vigilance. But as part of the increased security, Disney has also announced a ban on all adult costumes - and the ban (at the moment) will even apply to special events like Mickey's Not-So-Scary Halloween Party, Star Wars Weekends, Dapper Day, and 24-Hr Day. Technically the Disney Parks have always had a policy that adults can't dress up on ordinary occasions - only for special events like MNSSHP and 24 Hour Day. But in recent years they've been very lax about the policy, and they've seemed to encourage the adult costumes and used them as a selling point for events like Dapper Day and Star Wars Weekends. There's a thread on the DIS with lots more discussion about this. The costumes for everyone added a lot of magic to the special events, and I hope Disney will change the policy back and allow them at least for the Halloween Party. 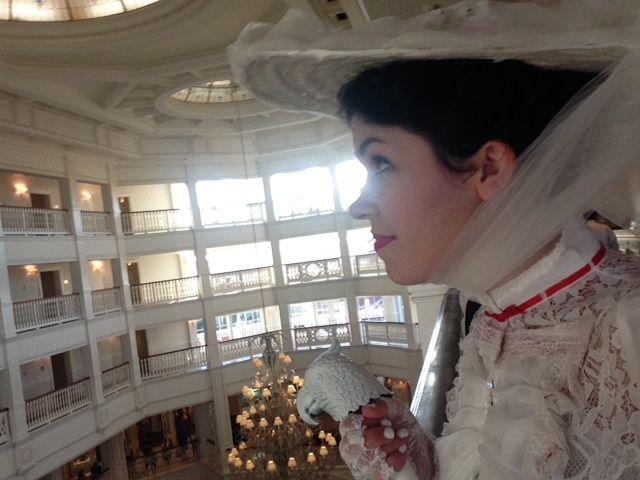 We were thinking about going to 24-Hour Day again this year - I would love to wear my Mary Poppins costume again - but I doubt we'll go if we can't dress up. I would like to introduce a new face to the Pixie Dust milieu today. ...meet the Strawberry 2.0 or, as I think I'm going to call it, the Rose Petal! If you're subscribed to my YouTube channel (which you should be! ), then you might have already spotted the video in which I chat about all my favorite features...I'm really loving the 3D touch! One thing I forgot to mention in the video was the camera on the new device. The new iPhone 6s has some amazing specs on both its normal outward-facing and its selfie/inward-facing cameras, and I've been loving it for photos & videos so far. I'm looking forward to taking the Rose Petal along on all sorts of new adventures...and of course using it to share with all of you! We're off to see New York City from above! Becky and I are taking you to the top of the Empire State Building. currently reading...St. Francis of Assisi by G.K. Chesterton. currently listening to...Renegades by X Ambassadors. ...From Berkshire to Buckingham is one of my favorite Duchess of Cambridge style blogs. Currently she's speculating on what evening gown Kate will wear to the State Banquet in October! ...breakfast at Disneyland's Jungle Cruise attraction - say what?? When you see the price tag you will definitely say what...lol! ...Gryphon the wonderfully adorable & snarky dog takes over Tobuscus's channel. Gryphon is my favorite. ....I could watch Bored Shorts TV all day. "Are we motorcycle buddies now?" ...we're taking a stroll around the Polynesian Village Resort today! I was excited to check out the new Disney Vacation Club areas at the Poly on our trip. The Tahiti and Rapa Nui longhouses have been renamed Moorea and Pago Pago and spruced up with new designs for the new DVC villas inside. There are room tours out there of the inside of the villas; today we're focusing on the public DVC areas. A new map of the Polynesian - the buildings are all in the same places, but those Bora Bora Bungalows stretching out into the Seven Seas Lagoon are all new!